If we hadn’t homeschooled, he probably wouldn’t have developed his passion for filmmaking. He might have, but probably not to this extent. He wouldn’t have had the time to make all those films with his buddy when he was fourteen and fifteen; he wouldn’t have studied Hitchock’s films for months as a homeschooling project; he wouldn’t have spent so much time at the youth filmmaking program which he’s attended for almost three years now. If we hadn’t homeschooled, we probably wouldn’t have traveled so much. He might not have figured out at such an early age how much he loves cities. It surprised me how much he loved London at nine, Rome at fourteen. And he was awestruck from the moment we dragged our suitcases out of Penn Station in New York City when he was fifteen. If we hadn’t homeschooled, he might not have developed the notion that you should love what you’re learning. That covering a bunch of subjects to satisfy other people isn’t how you ought to live your life. And he might not have believed that at seventeen you can know yourself, and know what will make you happy. This kid knows himself. He knows what will make him happy, and he’s gone out there and made it happen. This past weekend Chris and I took H to a weekend for admitted students at H’s college of choice. In New York City. That’s about as far across the country as you can get from where we are in California. But the weekend was thrilling. And the school seems about the most ideal place for H that I can imagine. Have you ever been to NYU? It sits smack in the middle of Greenwich Village. It isn’t a typical college campus–there are no boundries, or football stadiums or fraternity houses. Classroom buildings are tucked in between thrift shops and falafel joints and subway stations; you know it’s an NYU building when you see the purple flag waving above the entrance. 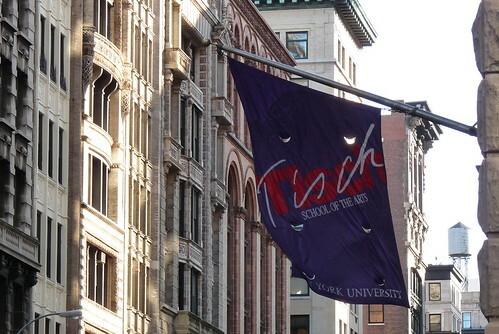 The Tisch film school is right there on Broadway. 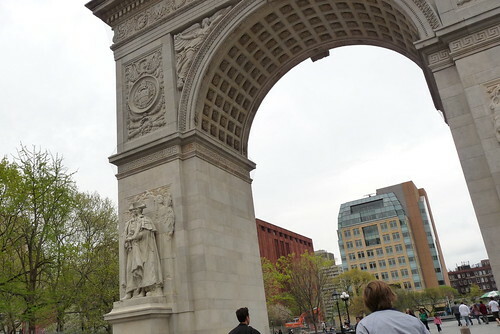 The school just radiates out from Washington Square, letting all of New York City become its campus. We got to wander around the Film and Television building, poking our noses into studios and Foley booths and talking to professors. Unlike at other film schools, H will likely take a single general ed course each semester, and the rest will be all film classes, all the time. After two years of high school, H has had it with general ed. He wants to explore what he wants to explore and he wants to do it now. 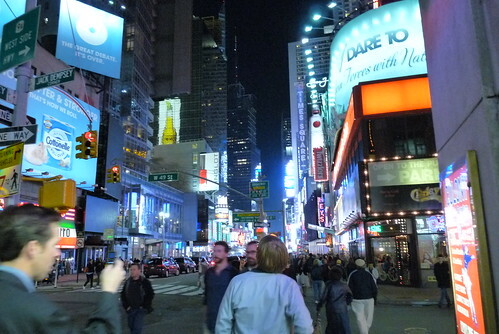 And the thought of living in New York City thrills him like you would not believe. So now I have to prepare myself to ship my first baby across the country in September, to live in big, bad NYC. I’m sure it hasn’t hit me how hard it will be to have him so far away, to see him so rarely. And I would probably be a puddle of tears and panic right now–if I weren’t so dang excited for him. 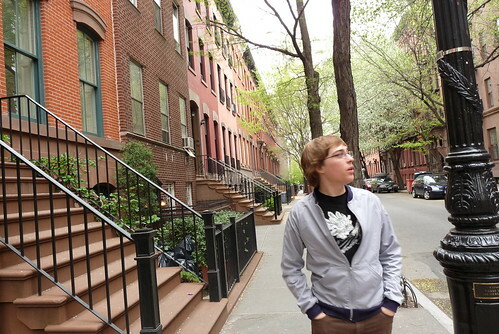 If we hadn’t homeschooled, he might never have gotten the notion to study filmmaking in New York City. But he did, and in a few months he’ll be leaving. Darned homeschooling. It creates independent kids who know what they want out of life. Thrilling and terrifying pretty much sums it up! sniff sniff. so scary and exciting all at the same time! what a fortunate kid he is to have such cool parents. i know you’re lucky too 🙂 i keep meaning to write and tell you that this reminds me of the tv show felicity. 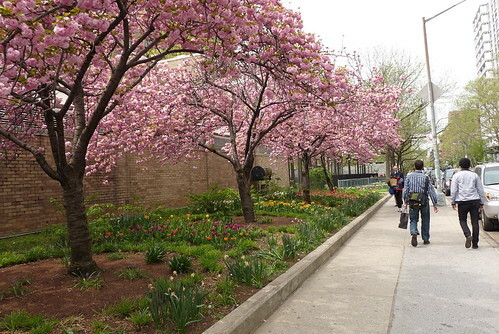 it was on when i was in college (though my college experience was soooo very different from felicity and h’s), but i loved the whole feel of the nyu campus. it was a great show. i actually cried when the show ended. silly, but i was hormonal and pregnant when it went off air. it remains one of my favorite tv shows (the list is very short, me not being a big tv fan). Guess whatever is exotic and far-flung holds the appeal! Yeah, forget it. What were we thinking? What ever made us think it was a good idea for them to think for themselves? How wonderful – it is so exciting to watch our grown and almost-grown homeschoolers go off and follow their interests. Mine are both far away, but it makes me happy, not sad, to see them busily studying, working, and making art. This is the way it’s supposed to be! Congratulations. It’s the way it’s supposed to be. You are so right about that. This is truly thrilling. It’s so awe-inspiring to see young people right where they need to be. Sigh. I don’t want my first baby to completely grow up, but it’s happening, like it or not. Heck, I don’t want my youngest baby to grow up, but we don’t always get what we want, thank goodness. And if your youngest baby hadn’t grown up, she wouldn’t be so fun to talk to. Watching them grow up is a little less miserable when you like who they’ve grown up to be. I know you’re right there with me on that. The look on H’s face in the photo above says it all; he was awestruck. It’s going to be a wonderful experience for him–and kudos to his parents too! Let’s just hope his parents get to visit him as much as we’d like to! H has been a grown up for as long as I’ve known him. When he was 5 years old I would have hired him as my lawyer, architect or engineer. NY is so lucky to get a glimpse of your brilliant and beautiful boy. I have to stop typing…. I’m getting a little teary. Congrats to H. I am just holding on to the memory of him asking for a can of Bwackbewwy Bwamble. Aw, you’re making me teary! You spent so much time with him at three–and then you didn’t see him much after that. I think you probably have a better memory of the three-year-old H than I do. My memories of all his ages get muddled up. Thinking that he once said Bwackbewwy Bwamble breaks my heart a little. I highly recommend staying there in lalalala land as long as you can. I’m still in denial that Mr T is ever going to be a teenager, and I’ve already been there twice. He’s always going to want to snuggle up under a pile of blankets and read with me, right? I am reading the Tao of Pooh right now and I am often reminded how many of us in homeschooling try ti respect the Inner Nature of our children as much as possible. We feel a gnawing sensation in the pit of our stomachs when they have to do something that goes against this nature. Most of the time we trust enough to let them be! You are a champ at this and i heartily congratulate you on letting H follow his Inner nature. I also know what it is like to have one of our dearests so far away. We here will also miss H alot. Jenny. Well, you know H: he has an inner nature that’s hard to deny! Not always easy, but he’s made me a better mother for it. And whenever I wonder how I’ll make it having him so far away, I think about you. If Jenny can do it, I can too! I know you cherish every minute of time you have with your own oldest. I think you’re right: it’s hard to worry over the distance when I can see how excited he is, can feel how proud I am that he’s done this for himself. Those feelings supersede all the others. Well, all I can say is that you truely succeeded this child in every way a parent could hope to so way to go! Well, I can’t get him to pick up his laundry or stop banging his feet when he walks in the hallway…but he’s turned out pretty okay! Thanks for saying hi, Ruby! that was beautifully written. thank you from one mother to another. i have a friend who is struggling with her decision to homeschool her son. this link was sent along to her with the surest thoughts that it will inspire her and reaffirm her. your blog is lovely. i cannot wait to dive into the archives! Thanks so much for the kind words, and for stopping by, stephanie! Just popped over here from a link from Beauty That Moves. I was interested to see that your soon was going to NYU, and is interested in film. An old friend of mine, Mo Ogrodnick, teaches in that department. She’s great, and I’m sure your son will have a wonderful education. Good luck to you all! We met a few of the NYU film instructors and they all seemed wonderful. Thank you for the good wishes. 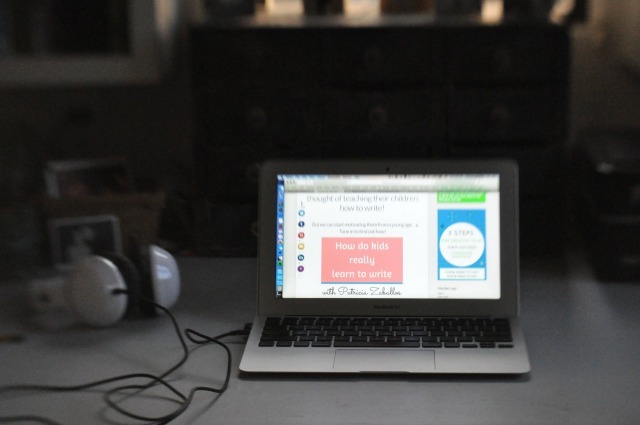 Your blog fulfills the lovely in its title! a friend sent me your link. I know you’ll say yes. 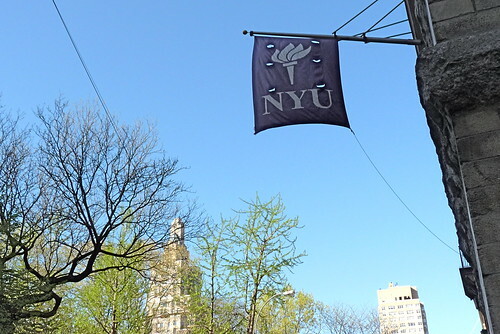 Will your son be going to NYU in the fall? we will find out in a week or two if he got accepted. He is presently a freshman at St. Lawrence U in Canton NY. just now seeing this! congratulations, H! congratulations, mama! i’m so very excited for him, and so proud to know you. weeee!!! See what happens when we don’t stay caught up? When are you coming to see my bees? I just have one thing to say to this: Follow the sparkle. i have sent two of my girls out into the world and i have often thought the same thing. why did we encourage them to spread their wings and fly? but alas, it’s a beautiful thing. It’s nice to hear from other moms who have survived it. Thanks for the reassurance, Randi! 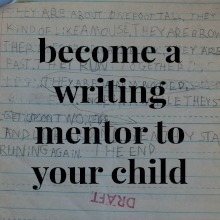 I find this so inspiring as I contemplate home/un-schooling my now almost 4 year old. I know we all tend to compensate for what we did not get–and this, the opportunity, active encouragement, and support to passionately pursue and develop one’s genuine interests, is what I missed out on. Nothing would make me happier than my own child being so clear and decisive with my backing and support. Well done, mama. I don’t know who you are, but you are amazing! I suppose it is a great gift to have parents who help you pursue and develop your interests. Then again, I’m not sure I deserve too much credit. I just slipped in the back of his roller coaster car, and strapped on my belt. Not that I didn’t try to climb into the front–oh, I have, so many times–but that was never nearly as fun. As you contemplate home/unschooling, know this: it is one thrilling ride! How wonderful to read this post as my young children and I embarque on our homeschoolling journey. Inspiring. Thanks you. Thank you for taking the time to leave a comment, Mélanie! And best of luck as you begin your own wonderful journey. How exciting for your son…and for you as his parents to watch his successes. I remember how exciting it was for me to hear stories of grown homeschoolers when I was just starting out. It’s an amazing thing, always. Thanks for taking the time to say hello, Debbie! You crack me up, wanderingsue, reading through my archives. Every time you write me that you’re still at it, I feel honored. 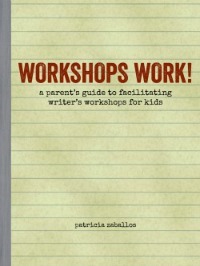 I think my next smaller, self-published book will be on taking dictation from kids. That’s the plan for now, at least!